If you are unaware of the battlefield franchise let me sum it up for you. 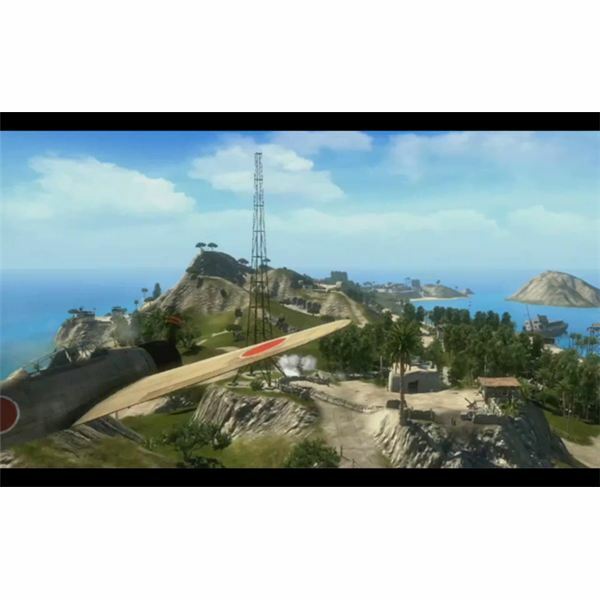 The name is quite explanitory, it is a first person shooter which incorprates as much as the battlefield of war as it can. In plain English, this means land, air, and sea fighting takes place. There are airplanes, bombers, jeeps, tanks, boats, and aircraft carriers (can’t control that last one though) in Battlefield 1943. The newest part of the franchise, Battlefield 1943, contains one mode called conquest. This consists of players starting at a base or aircraft carrier. Both teams then race to capture flags/spawn points while killing the other team and decreasing their infantry reserves. EA/Dice calls them tickets, but ultimately its the amount of troops that can reinforce the battlefield. There are 5 flags on all maps in Battlefield 1943, and if one team holds the majority the losing team begins to lose reinforcements automatically. So it stands to reason the more land you grab the faster your opponents lose soldiers. Another big part of Battlefield 1943 are the class system. However, there are now only three classes as opposed to 1942’s five. The remaining three are: scout, infantry, and rifleman. The five classes have been condensed so that all the jobs can still be accomplished. Engineers are gone because infantry now carry wrenches to heal tanks/planes/etc. Medics are gone because in the modern day of shooters no one ever has a health bar! Merely a red glowy imageset that appears on the screen whenever being shot, however taking cover for a few moments removes the need for a medic. You may be disappointed in some areas of the gamepla in Battlefield 1943. Certain things are missing… aside from the numerous amounts of maps. I just thought I would warn you. When in a ship or plane as a passenger in 1942, you had to wait until the driver lowered the door in order to run off into the fight. However in Battlefield 1943, you simply appear behind the ship magically, and I have heard several people complain saying that it takes them out of their element in a way 1942 never used to disturb. Also there are less classes, and no customising for your personal arsonel in Battlefield 1943. There are four weapons, three of which have different japanese/american models; however these weapons act the same. They are the sniper rifle, the SMG (Thompson for US, Type 100 for Japanese), the rifle (Garand for US), and the pistol (which only snipers carry). Once you can accept the fact that Battlefield 1943 is a watered down sequel (or "Bad Company-ized") you can start to enjoy it more. Obviously if you compared the graphics in Battlefield 1943 to Battlefield 1942 the winner is aparent. However, the engine controls are a little bit more than just what you see. There are a few new features in Battlefield 1943 that change the way people play the game. Buildings (aside from pillboxes on the beaches) can be destroyed down to the very foundation, with grenades, tanks, planes, anything explosive. Luckily, every class in Battlefield 1943 gets some form of explosive. If you have played Battlefield: Bad Company, you will know that cover changes very often if a tank knows where you are. The same is true in Battlefield 1943 except that there are far less buildings and far less cover. This gameplay mechanic truly changes the way one plays this pacific campagin, a building is no longer safe refuge from explosives. Another thing I’d like to note is that now when flying a plane in Battlefield 1943, you may accidentally glide/touch the water without blowing up instantly. Crashing into the water is still a likely possibility but now you may dip a wing in the water for a moment without completely ruining your turn in the plane. Way to go water physics! There is something that just gets to me about this Frostbite engine in Battlefield 1943 though, something that most shooters have gotten around to incorporating. Shooting people through walls. The forstbite engine gives the wrong impression, that destruction is at your very fingertips, however it contradicts itself by presenting the fact that wood panneling stops bullets dead in their tracks. The Scout: Carries a sniper rifle, pistol, katana/sword, and dynamite. The scout is as it is in all games very deadly at a range and vulnerable when upclose. Unless you get the upperhand with your melee weapon. The model of the scout is always in some form of jungle camoflauge, which is helpful since all three maps are similar vibrant colors of green mixed in with the water and beaches. The dynamite must be place and then a plunger is charged to blow it all up. It is probably the most powerful explosive in the game, while the hardest to use. Infantry: Carries SMG, grenades, bazooka, and wrench. Two grenades and three bazooka rounds at a time. When they are empty or one presses the reload button when holding the weapon, the ammo reappears. The wrench is used for repairing anything from anti-air guns to tanks to planes. Infantry is very deadly against tanks and soldiers at closer quarters, however at the long range he is quite vulnerable. Rifleman: Carries a semi-automatic rifle, attachable grenade, grenades, and a bayonette. The rifle is deadly accurate, the rifle grenade is effective at dealing damage to tanks, buildings or destroying oncoming jeeps. The grenades come in handy when clearing buildings, and the bayonette is just like any other melee weapon, except it has a quicker draw. The rifleman are the most balanced of the three classes. Umm… Driver I’d like to get off here please. Vehichles. A battlefield game would not be a battlefield game without them. At your disposal in Battlefield 1943 you have jeeps, tanks, boats, and planes. Planes are a one man craft however, so expect fighting over the two planes that spawn in your base at the beginning of a round. 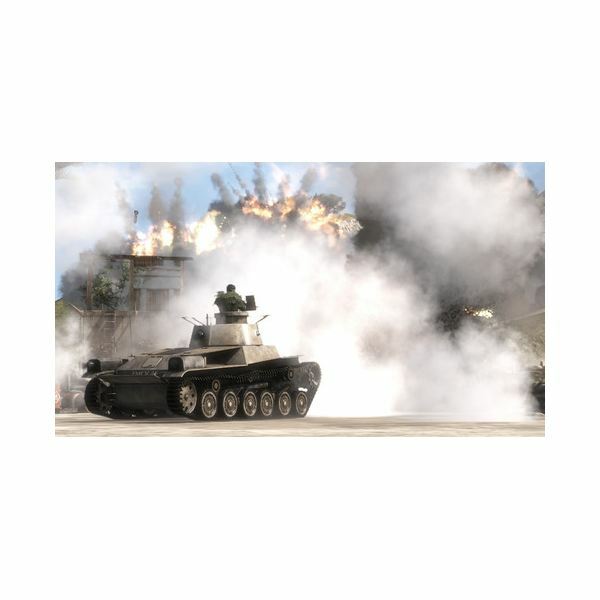 Same with the tanks, but if you can always ride on the back of a jeep to heat up the sky with MG fire in Battlefield 1943. However, the jeep and boat are mostly for transport, seeing as they are quite vulnerable to explosive damage. The tank in Battlefield 1943 is slow and powerful as one might expect, but the way the cannon is effected by gravity, and the way that side of the building just blows up when you make contact… it’s all so beautiful… and satisfying. Seriously though, the destructive nature of the environment leads to such a nice tank experience overall in Battlefield 1943. Same could be said of the planes. Dog fighting in Battlefield 1943 is an elaborate experience that takes some getting used to. The plane requires the biggest learning curve in Battlefield 1943. Successfully bombing a tank from the air takes a lot of practice and timing. If you want to fly around without all the anti-aircraft fire, you can play the tutorial in the option menu; in that safe environment it’ll be much easier to get the timing down on dummies before going out and bombing the real thing. However if you can’t get flying down in Battlefield 1943, don’t worry! You can still be the one to call in the air raids. You control three planes that fly over the map one time, and you get to choose where to bomb. Its quite effective in multiplayer, but go try it out in the tutorial first. To simply state, there is one game mode in Battlefield 1943, and an alternate way to play. That’s if you exclude training, which lets you run around Wake Island without any enemies, learning the ways of combat on land, sea, and air. 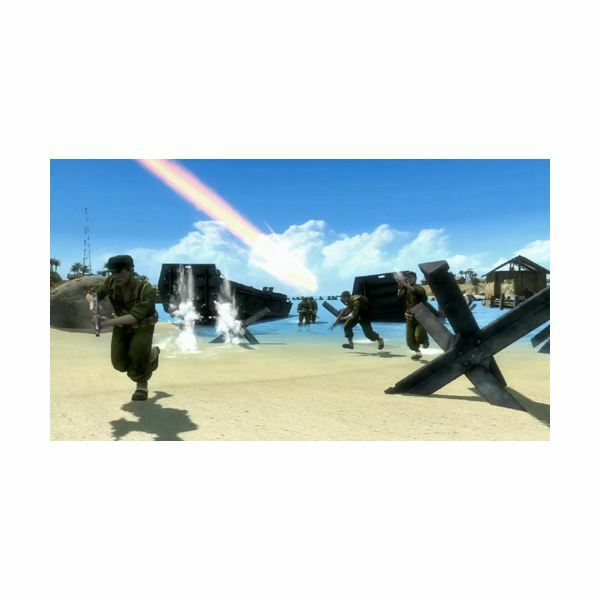 The one game mode in Battlefield 1943 is called Conquest, and the alternate method of playing is called Air Superiority. 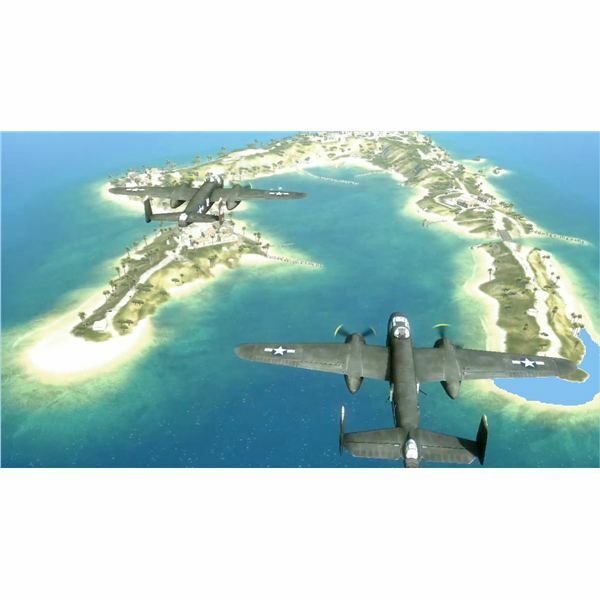 This consists of an all air combat zone over a map called Coral Island. But lets focus on Conquest for the moment, what it is and its pros and cons. What is conquest mode: 5 flags, all start neutral. As your team flys/boats onto the island your first objective will be to capture these spawn points/flags. Doing so will give you points, along with giving your team a new spawn point, it also resupplies the base with jeeps/tanks/etc. The goal of conquest mode is to decrease the other teams "tickets" or reinforcements by killing their infantry and occupying more territory than your opponent. Say for instance you hold three of five flags, the enemy team will start to lose reinforcements, if you hold more flags the enemy loses troops faster. Pros: Its a nice simple way of keeping the frag fest simple. Flags help concentrate battle in the right areas of the map. The idea of having a limited amount of reinforcements is a much more tangible victory condition, as opposed to a time limit or score count. Cons: Ultimately it is just the same as keeping a score count going backwards though, to refute the last Pro I mentioned. However the biggest con is the gameplay style that conquest mode encourages. Let me elaborate; DICE (the developer) advertised their game with the slogan "Storm the beaches!" staring American soldiers running up a beach with explosions all around. However the conquest mode rarely produces a situtation where one team is solely defending or attacking. It is a constant land grab rather than a battle that has a defined front. There is rarely a time when anyone is actually storming a beach from defenders. The game mode is to blame. That being said conquest is still a decent game mode, especially if theres only going to be one in a game. It keeps the action heavy with both teams fighting tooth and nail over respawn points in Battlefield 1943. Battlefield 1943 has broken the record for digital sales. It is obvious that gamers around the world love the series and enjoy the game. It could be due to the fact that after 43 million kills in game meant unlocking Air superiority mode and the map Coral Sea, which pits four aircraft carriers against each other. However I can not give Battlefield 1943 a five out of five. Even after being 15 dollars, entirely downloadable (which are two of my favorite qualities), and an amazing game, I cannot justify a perfect score. There was very little innovation done on a design level, seeing as it is a sequel tribute to another game. Yet, still I remain firm in my judgement, that all games including sequels should attempt to stand out in a creative sense so as to challenge all other publishers and developers to do the same. But then again, this is EA we are talking about. To conclude however, I am going to suggest that you buy Battlefield 1943, or at least play the demo. It is a fantastic shooter experience for a very cheap price tag. I have been hooked to it since the day it came out, and I’m going to go play right now. 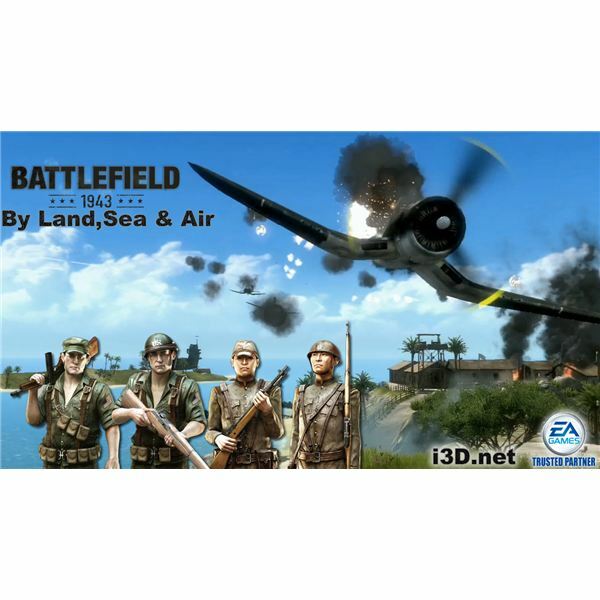 Battlefield 1943 is also available for the Xbox 360 Arcade, and you can find a great review on that game here on Bright Hub as well. A collection of reviews for Battlefield 1942 and 1943. PC Game Review – People are still playing Battlefield: 1942!